Nancy Csabay is one of the contestants on this season’s The Amazing Race Canada. 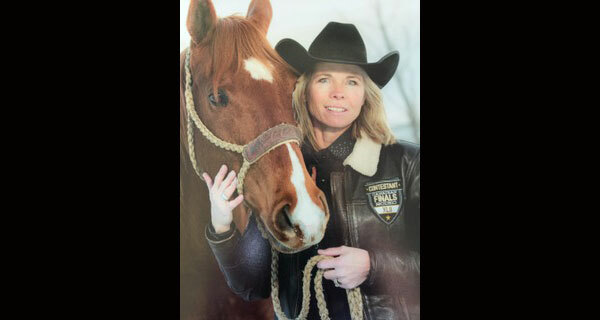 Nancy is a breast cancer survivor and a well-known barrel racer, and her teammate, Melissa Hollingsworth, won a bronze medal in the 2006 Turin Olympics for skeleton. I was able to chat with Nancy about her career in barrel racing and her time on The Amazing Race Canada. 1. Tell us about being on Amazing Race Canada. How were you chosen and how have you found the experience? Yeah. I was chosen … I want to say a couple of ways, in some ways. Well, this year was the first year that they actually had nominations. I have some awesome barrel racing friends that have come to my retreats, and they all decided to rally together and send in some nominations for me, which was really, really cool. The other way was a friend of mine had posted that the casting call was open for The Amazing Race Canada on Facebook. I decided to share it because I’ve always wanted to go on The Amazing Race. I shared it, and I said “Who wants to do this with me?” I had quite a few people say, “Pick me.” Mel was one of them. She ended up sending me a picture on Facebook Messenger with her and John and one of the clue envelopes and said “I think we’d make a good team and maybe we should do this together.” That’s kind of how it worked. I actually sent in audition tapes with my brother, as well, and two other barrel racer friends of mine, and then Mel as well. I kind of just left it up to The Amazing Race to decide who would be best for their show. 2. How do you think being a barrel racer prepared you for The Amazing Race? I think it helped in many ways just because we don’t mind getting our hands dirty. Tasks that we do at home like cleaning pens, cleaning waters that are all gunky, just every day things that we do around here that most city kids probably would not want to do. Hauling bales I think even helped me prepare for it. Gardening helped me prepare for it … the things that I do around home. Barrel racing, like my competitiveness, helped me. Being able to stay present in the moment like I do on my horse, Wicked, really helped me. I think that it’s a combination of things, not just barrel racing. I think it was the way I was brought up. My dad was Canadian All-Around Champion, and my mom was Miss Rodeo Canada, so I think their work ethic helped me on the show, as well. You just don’t give up. You know you’re going to make it, and just stay positive. That really helped. That really, really, helped. It was a combination of how I was raised and, of course, absolutely barrel racing and horses really, really helped me be where I am today. 3. Tell us about the horses that you own. We have eight right at the moment. My main horse that I barrel race on now, her name is Little Miss Wicked (aka Wicked). She is 14, a Quarter Horse that we raised. We still have her mama here, and trained ourselves and has just been a blessing. She has changed my life immensely. My life wouldn’t be as it is if she wasn’t in it. 4. Tell us about your career in barrel racing. Well, it’s been a long one. Ever since I could walk, I’ve been riding horses. We used to rodeo as a family, and go down the road with my dad when he rodeoed. Of course, the love of barrel racing came from my dad, I believe. That passion of horses was instilled, and an eye for looking at a well-proportioned, well-conformational horse came from him. It started before I could walk, I’ve been on a horse. I have a passion for it. My barrel career, well, it has had its ups and downs like most people’s careers. There are times where I’ve wondered why the heck am I doing this. This is very expensive, and I’m not getting anywhere. Little did I know, every horse that I’ve owned has taught me something. Back in your twenties, you’re wanting lots of success, and winning was really, really important. As I get older, things have changed for me. Me having breast cancer, for example, kind of opened up my eyes and showed me that life is worth living. It’s not about the winning. It’s about the living. Now that I’m older, I kind of gave up the attitude that I needed to win, and low and behold I start winning. You know, I won two Canadian championships, one in 2015 and one in 2016 on Wicked. 5. What do you enjoy most about working with horses? There’s so many things. For me, it’s a sense of freedom when I’m on their back. I feel free of all worry and care. I feel as if a weight has been taken off, and so that is what I enjoy the most about being on the back of a horse is the freedom. Also, isn’t it amazing that a 1,200 pound animal will do exactly what I ask? 6. What has been your most favourite place to visit so far on the race? 7. What has been your most difficult task? The first five minutes of the pie eating was not difficult, but the rest of the day was really difficult. I chowed down on that pie like nobody’s business. I was done like in five minutes, but it was after the fact that, oh my God, I was so sick. 8. What can you share about what’s coming up in the show? The best part of this whole show … I’m sure the tasks and stuff have been fun, but it’s really been the people. The other racers are incredible heroes that have changed Canada in some way. They’ve impacted someone in Canada somehow in their own way. They’re all cool. The producers of the show are amazing people and I am so grateful to be kind of part of the family now, right? 9. What happens after you reach a pit stop? Do you have a chance to sight see or is it just sleeping and refueling? I’m not really sure how much I get to tell you on that. There is some downtime after each leg, but usually it’s just you eat, you sleep, and then you’re off again. You know, I have no idea what the future holds. What I’m hoping for is a life filled with love, and health, and happiness because I really believe that’s why we’re here on earth is to be happy.